Kevin's promotion to President of New Penn was a natural next step on the path of leadership progression. 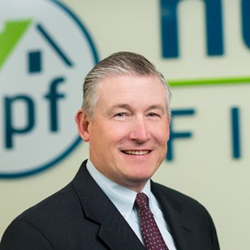 National mortgage lender New Penn Financial (New Penn) announced the promotion of Kevin Harrigan to the position of President. Harrigan joined New Penn in 2013 and most recently served as the company’s Chief Operating Officer. In his new role, Harrigan will lead New Penn’s daily operations. He will also join New Penn CEO Jerry Schiano and Shellpoint Partners co-CEO Bruce Williams on the executive management committee for the origination company operated by Shellpoint Partners, the parent company of New Penn. Harrigan has more than 30 years of senior management experience in financial services and mortgage banking, including positions with Avantor Capital, Bank of America, and KeyCorp. He studied at the Weatherhead School of Management at Case Western Reserve University and earned a Bachelor of Science in Finance/Economics from Rutgers University and an MBA from Seton Hall University. New Penn Financial has become a leading nationwide lender by bringing expertise, extremely competitive rates on a broad portfolio of mortgage products, and exceptional customer service under one roof. Founded in 2008, and licensed in 48 states, the company and its reputation have grown rapidly under the guidance of a management team with years of experience in the mortgage industry. New Penn is headquartered in Plymouth Meeting, Pennsylvania and operates offices nationwide. New Penn is a Shellpoint Partners company. More information is available at newpennfinancial.com. Shellpoint is an experienced, customer-centric specialty finance company focused on the U.S. residential mortgage market. A vertically integrated mortgage platform with established origination and servicing capabilities, Shellpoint is an approved Fannie Mae and Freddie Mac seller and servicer and a Ginnie Mae issuer, with servicer ratings from S&P, Moody’s and Fitch. As an RMBS issuer and industry participant, Shellpoint is also committed to helping define the new market standards and practices that will support the growth of a healthy and responsible RMBS market. For more information, please see the Company’s website at shellpointllc.com. About New Residential Investment Corp.
New Residential focuses on opportunistically investing in, and actively managing, investments related to residential real estate. The Company primarily targets investments in mortgage servicing related assets and other related opportunistic investments. New Residential is organized and conducts its operations to qualify as a real estate investment trust (“REIT”) for federal income tax purposes. The Company is managed by an affiliate of Fortress Investment Group LLC, a global investment management firm.